Delicious and moist, this Nutella Swirled Banana Bread is begging to be made! It freezes well too! I may have mentioned this once or twice, but I love Nutella. And banana bread. And pretty much anything that goes well with a hot cup of coffee. Baking up this bread is so easy, and I think you will LOVE that it makes two loaves. One to enjoy now. One to enjoy later (it freezes well!). Or give a loaf to friend. Or family member. Or teacher. Speaking of teachers, I should probably send in a loaf to my 5th graders teacher ASAP. Our new house is across the way from the school, and while I sit on my back deck enjoying a cup of coffee and slice of this bread I can hear the kids at recess. Yelling, screaming, laughing. And I know my child is in the mix…yelling, screaming, laughing. Hopefully burning off some of the excess sugar from the lunch I packed. Actually, I don’t pack my kids lunches. Cause that’s what good moms do. Or moms with time on their hands in the morning. Nope not me. I set the guidelines (main course, fruit or veggie, snack, treat, drink) and they pack their own lunches. For the most part they are pretty good at it. Occasionally I have to intervene and remove certain items. I definitely don’t make those cute little Bento boxes you see on pinterest. The ones with all healthy foods. Cut into cute shapes. Yeah. No. My kids would need about 3 boxes a piece to fill up on, no joke…they eat a lot! Plus, seriously, do you make those the night before? Cause I have zero time in the morning to cut cucumbers into turtle shapes. But they do get to enjoy slices of Nutella Banana Bread in their lunch. I tend to count it as the “treat” of a lunch…but my oldest daughter tends to think it’s a main course (I secretly like the way she thinks, don’t tell her though)! I guess she has watched too many Nutella commercials. And duh, bananas! Oh well. Whichever category you decide this bread falls into, enjoy eating it! I’m sharing this recipe over at Food Fanatic today. Normally I’m the candy contributor, but they allow me make real food too sometimes. 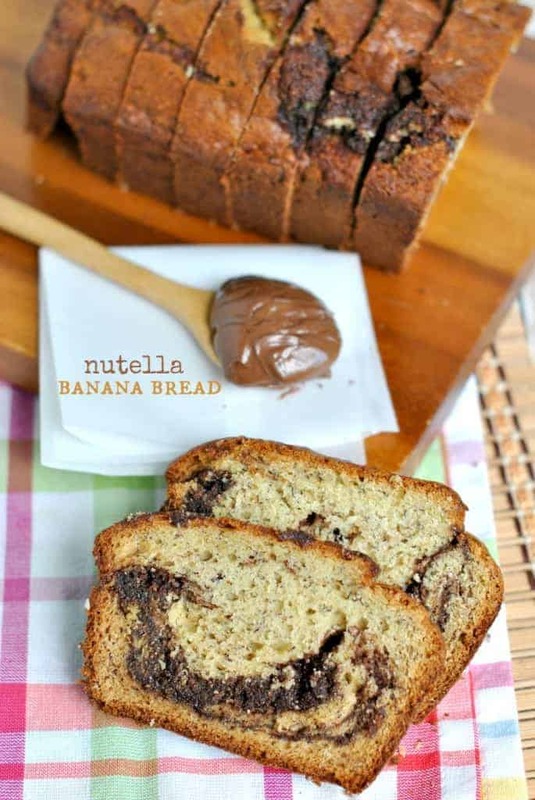 And I think Nutella Banana Bread definitely falls into the REAL FOOD category….real food you must eat now! I would have this with coffee. Or water. Or just by itself, because that’s how super amazing it is! Oh yes! Anything with Nutella in it has me sold! Love that swirl! Nutella swirled banana bread in your kids’ lunches?? Can I be adopted? 😉 My parents always used to pack my lunch the night before, minus the apple that they sliced in the morning to keep it from browning. It was always the same: a half sandwich (either plain PB or bagel and cream cheese), fruit, treat, juice. Plus the morning snack. I miss those days — making my own lunch is too much work! 😉 Pinned! Haha, parents are weird when they decide what is and what is NOT acceptable in lunches. We get in such a rut. My kids get into a rut too, no doubt! But banana bread is a great cure for that 🙂 Thanks for pinning! I just wanted to tell you I LOVE your blog so much. Do you have a section for people allergic to eggs? Or could you recommend how to change this recipe? Just realized I spelled your name wrong too. I am sorry. I hate when people do that to me, so I apologize for doing it to you!! Haha, no worries on the spelling 🙂 Thanks for pinning! Now this is my kind of banana bread! Looks SO good!! Did somebody say nutella? I’m so there! This bread looks incredible – bananas and chocolate = ultimate indulgence! Indulgence indeed! Especially if you eat half the loaf. Not that I would do that, just saying…. 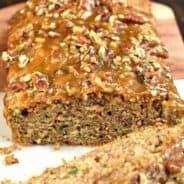 Two of my favorite things combined into one delicious quick bread. I’m dreaming about this toasted with a little more Nutella! You have some lucky kids! I would want a slice of this bread in my lunch box now! My stomach and mouth are begging me to make this! Love that nutella and banana combination!! Holy Yum! I already love me some banana bread and nutella. This is a dream combination. Love it! I want a slice of this bread so badly right now! My coffee needs it! I’ll trade you some bread for one of those lattes! Better yet….let’s just get together…I’ll bring the bread, you bring the pumpkin lattes! I can bet that my husband is going to see this in his Pinterest feed tonight(don’t tell anyone he has a Pinterest account though) and ask when I’m going to make some for him. Can’t go wrong with bananas and Nutella! 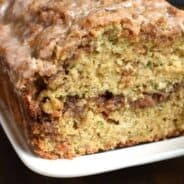 Nutella and bananas are such an awesome combo and banana bread is one of my favorite breads to make in the autumn! 😀 This looks lovely, Aimee! I’m. In. LOVE. Nutella + banana bread is the best thing ever. I like your daughter’s thinking. Often it’s mine too! LOL! You won’t find those cute Bento boxes around here either. No way am I getting up early to do that or give up time in the afternoon or evening for it. Our kids are perfectly capable of making their own lunches. Gotta love this stage in life!!! 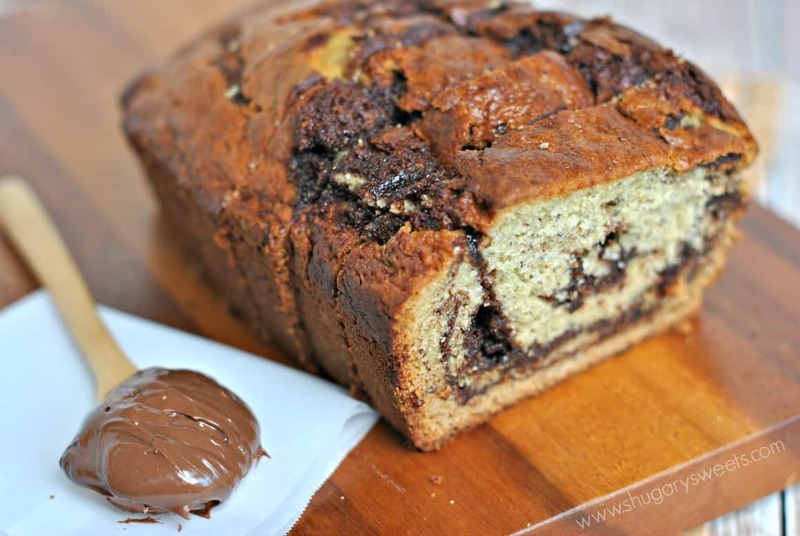 Now Banana Bread with Nutella swirled in…that’s what I call a perfect lunch box filler! Love it!!!! Plain butter doesn’t go with coffee. This, buttered, does go with coffee. Now bring me a couple slices please! 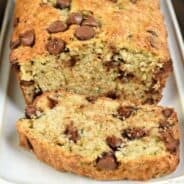 Banana bread just got a million times better! That nutella swirl is sooo pretty and looks SO delish!